With a list price of £189, Sharp's first stab at a Freeview HD set-top box seems vastly over-priced, but look online and the TU-T2 is already discounted – and a good job, too. A basic, very small and easy to house black box is what you get, but its glossy fascia is interrupted by a rather brave lightbox studded with eight blue LEDs that twinkle and refresh every time a command is issued from the remote control. There's also a large standby button on the front, which is good (and rather rare) news for those who hate the energy-guzzling 'always on' nature of set-top boxes. 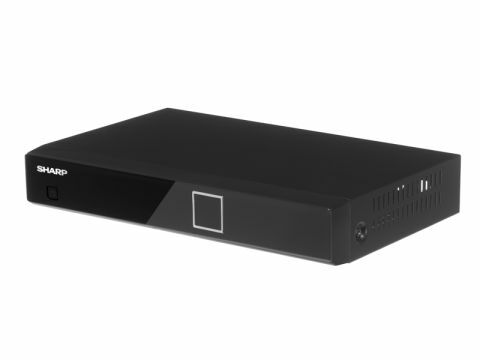 Elsewhere the TU-T2 has all it needs to provide Freeview HD pictures – a single DVB-T2 tuner and a HDMI output. A brace of Scarts adorn the back (one to connect a VCR) alongside an Ethernet LAN port for future iPlayer-type upgrades, an optical digital audio out to hook-up to an amplifier (in Dolby Digital Plus once it comes to Freeview), a software upgrade-only USB slot and the all-important RF (and RF loopthrough) input for the aerial. If you fancy something a little more comprehensive, Sharp has an identical-looking step-up called the TU-T2HR32, a £299 Freeview+ HD recorder that boasts a 360GB hard disk and a couple of DVB-T2 tuners, slated for mid-June.